6 babies last week, 2 on Tuesday, one on Wednesday, 2 on Thursday and one Saturday night. I may have re-injured my wrist, too, or it could just be the weather (which has been pretty scary here in Northern Illinois). Also, child #6 is here for a very short visit and so we have been trying to get stuff done. She has been a blessing while here - she has been cooking a fair amount. Dinner tonight was a vegetarian delight - sweet potato burritos with a black bean/pinquito dish and curried almond rice. I keep planning to make rhubarb jam - the plants are fat and happy and now is the time - if I can find the time. CSA last week was whole wheat flour, lettuce, spinach, and radishes. This week will probably be fairly lean due to the overabundance of water falling out of the sky. It has been a strange weekend. I keep waiting for the shoe to drop - I have 5 moms all due or overdue, and not a single call all weekend. Probably just as well. We were without power from around 1100 Friday AM to around 1330 Saturday PM. And since we are on a well, no power means no running water. That means no flushing toilets, folks. We keep a reserve of drinking water on hand, but I was not about to use that to flush with. And, since the garage doors are electronically opened, we just parked in the driveway. I was the most concerned about the food in the fridge and freezer - but the insulation worked well and we really didn't lose much at all. The ice cream went through a partial thaw and refreeze cycle,but the meats etc are still good. Thanks be to God! We got the rest of the vegetable garden put in. Went to the farmer's market and bought some heirloom tomato plants. One is called a Polish Linguisa because of how it supposedly looks, and then there was one that has a long Pennsylvania Dutch name. Also one that was developed in Greece We shall see how they grow and how they taste. CSA delivery is supposed to start next week. Probably it will be a load of salad greens. I can live with that. My weight has plateaued and I really need to lose some more for my own health and sanity. I found some new shoes that I really like and that actually fit my size 11 feet. 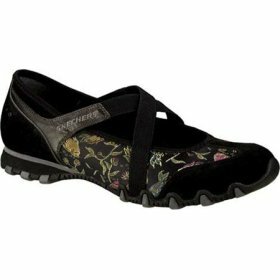 They are Skechers, the style is bikers waterlilies. I don't understand the naming conventions, but finding shoes for my feet is a major accomplishment. This page is a archive of entries in the Miscellany category from June 2008. Miscellany: April 2008 is the previous archive.